A welcome reissue for one of Roger Chapman's best-loved albums. 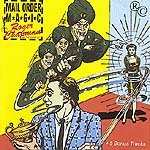 Mail Order Magic was Roger's second solo studio album in 1980 and his first fully self-penned release. This definitive reissue comes with five bonus tracks including three live recordings made in Germany at the time of the album's first release, exclusive line rnotes featuring quotes from band members and some previously unseen photographs.